Vihara is Sanskrit or Pali for (Buddhist) monastery. It originally meant «dwelling» or «refuge», such as those used by wandering monks during the rainy season. In the early decades of Buddhism the wandering monks of the Sangha had no fixed abode, but during the rainy season (Cf. vassa) they stayed in temporary shelters. These dwellings were simple wooden constructions or thatched bamboo huts. However, as it was considered an act of merit not only to feed a monk but also to shelter him, sumptuous monasteries were created by rich lay devotees (Mitra 1971). They were located near settlements, close enough for begging alms from the population but with enough seclusion to not disturb meditation. Trade-routes were therefore ideal locations for a vihara and donations from wealthy traders increased their economic strength. From the first century CE onwards viharas also developed into educational institutions due to the increasing demands for teaching in Mahayana Buddhism (Chakrabarti 1995). In the second century BCE a standard plan for a vihara was established. It could be either structural, which was more common in the south of India, or rock-cut like the chaitya-grihas of the Deccan. It consisted of a walled quadrangular court, flanked by small cells. The front wall was pierced by a door, the side facing it in later periods often incorporated a shrine for the image of the Buddha. The cells were fitted with rock-cut platforms for beds and pillows (Mitra 1971). This basic lay-out was still similar to that of the communal space of an ashrama ringed with huts in the early decades of Buddhism (Tadgell 1990). 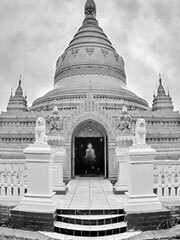 As permament monasteries became established, the name «Vihara» was kept. Some Viharas became extremely important institutions, some of them evolving into major Buddhist Universities with thousands of students, such as Nalanda. Life in «Viharas» was codified early on. It is the object of a part of the Pali canon, the Vinaya Pitaka or «basket of monastic discipline». The northern Indian state of Bihar derives its name from the workd «Vihara», probably due to the abundance of Buddhist monasteries in that area. In Thailand, «Vihara» has a narrower meaning, and designates a shrine hall. Chakrabarti, D.K. (1995). Buddhist sites across South Asia as influenced by political and economic forces. World Archaeology 27(2): 185-202. Mitra, D. (1971). Buddhist Monuments. Sahitya Samsad: Calcutta. ISBN 0896844900. Tadgell, C. (1990). The History of Architecture in India. Phaidon: London. ISBN 1854543504.